Fruit flies are proving the unlikely source of a new initiative to help improve postgraduate research opportunities in Africa, with the support of Cambridge academics. Drosophila melanogaster, better known as the humble fruit fly, has emerged as the unlikely basis of an attempt to help to stem a “brain drain” from African universities. While they may be loathed by many as a relentlessly irritating pest, fruit flies are nevertheless being used as an ally by a team of researchers who believe that they could play a role in cultivating research talent in Africa, and in preventing its loss to the rest of the world. Under a new project, called “DrosAfrica”, fruit fly research labs are being established at institutions in Uganda, Nigeria, and Kenya. The hope is that the training and research that these centres undertake will nurture a community of biomedical research scientists in Sub-Saharan Africa, and inspire other universities to follow suit. Despite their unglamorous reputation, fruit flies are of great value to scientific research and have played an often overlooked role in some of the biggest biological breakthroughs of the past 100 years. As an example, the first jet-lag gene, the first learning gene and the first channel proteins were all identified in flies. About 75% of known human disease genes have a recognisable match in the genome of fruit flies, and this makes them ideal for research on subjects such as cellular development and the causes of complex conditions, such as neurodegeneration, psychiatric diseases, and cancer. In Africa, where postgraduate scientific research in universities is often limited by financial constraints, or a lack of resources and infrastructure, Drosophila could therefore be a valuable tool. They are, after all, both cheap and – as people working in the food or restaurant industries tend to know only too well – available in plentiful supply. Dr Isabel Palacios, a Fellow of St John’s College, University of Cambridge, and one of the founding academics behind DrosAfrica, argues that this could help to resolve a shortage of scientific talent emerging from the continent. African researchers make up only 2.2% of the world’s academic research community as a whole, and Sub-Saharan Africa contributes just 0.6%. Lacking the tools needed to undertake world-class research, many African researchers also leave their own countries and move to better-resourced institutions, leading to a “brain drain” effect that has deprived their home nations of skilled researchers. 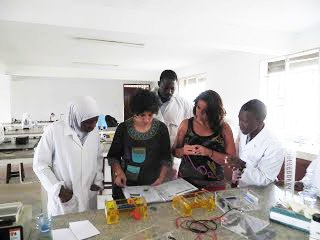 In 2011, Palacios and her colleagues began running annual workshops at the Kampala International University (KIU, Uganda) that set out to equip scientists and faculty members with the knowledge and skills needed to undertake research in biomedical science and state-of-the-art cellular biology using fruit flies. The success of these has been such that more are now being planned in Kenya and Nigeria for 2016. Participants are given guidance on how to set up their own research project to study topics such as cancer, the immune system, or infectious diseases. The workshops also provide opportunities to network with other researchers from across Africa who share similar interests, and allocate each participant a mentor who helps them further develop their own ideas and experiments. An online learning community has also been established, to promote interaction between alumni and the sharing of resources and information. The workshops have also now led to the establishment of new laboratories in various African Universities undertaking fruit fly research. According to a follow-up survey conducted by the DrosAfrica group, labs have been set up at the University of Nairobi in Kenya, focusing on host-pathogen interactions in various diseases; and at Kampala International University in Uganda, where MSc and PhD students are learning to use Drosophila in teams carrying out research on subjects such as antimalarial drugs, depression, epilepsy, and the role of nutrition in controlling stress. A project to establish a Drosophila unit at the International College of Health Sciences and Liberal Arts, Nigeria, by one of the senior DrosAfrica alumni, is also being supported by the group. In addition to doing research, these centres are planning to run their own workshops in the near future, which Dr Palacios hopes will enable the initiative to spread to other African institutions. She likens the model to that of Spain where, 40 years ago, top scientific research labs were few and far between. Almost by chance one lab started working on Drosophila and there are now several dozen of research centres – including some of the best Drosophila labs anywhere in the world – training emerging Spanish scientists. The DrosAfrica project involves academics from the Universities of Cambridge, Bristol and Bath in the UK, the University Pablo Olavide in Spain, the Instituto Gulbenkian de Cicencia in Portugal, and Kampala International University in Uganda. The project is supported by the Cambridge-Africa Programme and the Alborada Fund. Further information about the DrosAfrica project can be found at: http://www.drosafrica.org/. Drosophila melanogaster photo credit: Wikimedia Commons.